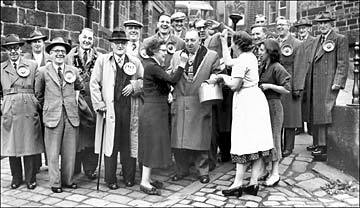 Members of the Ancient Order of Henpecked Husbands were unable to escape the wrath of landlady of the Cross Inn, Heptonstall, Mrs Mona Ridley, left, in 1957 or '58. Two other ladies add their two penn`orth for good measure! Code no CT101PR Reproduced by kind permission of Peter Robertshaw. The Hen-pecked Husbands Club - or The International Order of the Hen-pecked Club, to give it its full name - was founded in 1904 by six Methodist preachers, who met in an uninhabited cottage in Cragg Vale. That first meeting was shrouded in mystery - as were subsequent get-togethers of husbands apparently under their wives' thumbs, and members retained their anonymity to the bitter end (the club ceased around 30 years ago, one of the last meetings captured on camera by Martin Parr, featured in issue 11). A member known only as "Well Hen-pecked," who joined in 1956, explained the aims of the upper Calder Valley-based club in a letter to "The Dalesman," declaring that it was the only society of its kind in the world, with no subscription and, of course, all-male. The annual meetings usually took place on Easter Monday and were definitely not "boozy affairs," he added. Members appear, however, to have departed from their strict rule of men only, for a report of the meeting in 1974 included the following intriguing item: "Humbugs sent by the Order's only honorary woman member were passed round." The identity of the mystery lady has never been revealed!